Okay, so I'm kind of geeky about Star Trek. Not so geeky as to attend a Treky convention dressed up like a Klingon, but I do like the series. 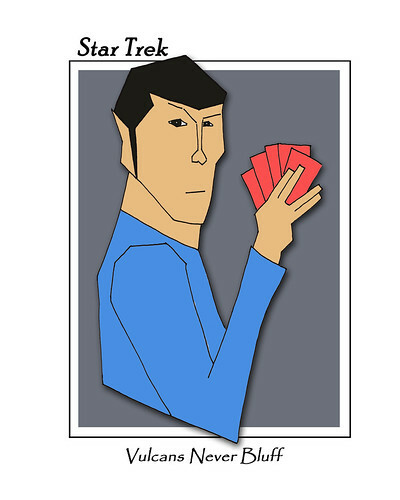 My family and I were sitting around enjoying an episode from the 2nd season of the original series (actually, the kids looked bored, but Ma and Pa were enjoying it), when Mr. Spock said, "Vulcans never bluff." And if that doesn't warrant a Star Trek cartoon, I don't know what does.